**** Chosen by Winner: Terry H.
This Tighe Breaker Integral automatic model has a CPM-S30V stainless steel blade with a compound grind. Based on the Tighe Breaker Integral custom, this mid-tech series from Brian Tighe & Friends presents the design in a more affordable format. The Tighe Breaker Integral sports a fully integral titanium handle, machined from a solid block of Titanium with fluted patterning and a lanyard hole. 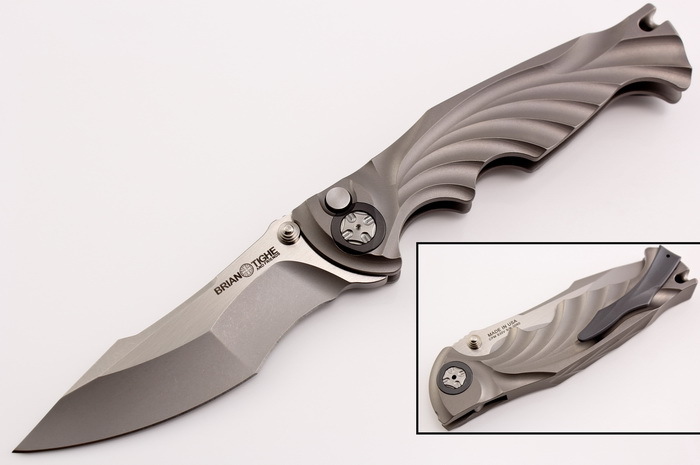 Push button activated automatic action allows effortless one-handed blade deployment. At BT&F we specialize in bringing innovative & advanced technology to the knife market making professional-grade quality folding knives. Made in the USA & assembled by hand, each BT&F knife carries a distinctive Brian Tighe trademark look that features original locks & designs that combine tactical precision & metallurgy artistry. Brian Tigh’s latest venture with BT&F is a natural progression of his career in the custom knife world. By bringing together a team of talented craftsmen and friends, Brian is able to bring his original designs to a much wider audience at more affordable prices.